What is the World Green Building Council? The World Green Building Council is an association that advocates for green buildings. Its mission is to drive the construction of green buildings for everyone by promoting sustainable practices and a healthy lifestyle. Limit global temperature rises to 1.5 degrees Celsius. Reduce the building and construction sector’s CO2 emissions by 84 gigatonnes. Ensure all buildings are net zero emissions. If you want to learn more about their initiatives, we encourage you to check out their website. So, what is this green building thing and why does it matter? While the construction industry is necessary for the development of our cities, it has a history of harming the environment. For example, energy use in buildings accounts for almost 40% of our carbon footprint. Buildings are also a major contributor to natural resource depletion, which is dangerous for both humans and other species. Green buildings employ construction techniques that can reduce or eliminate negative impacts on the environment without slowing down economic growth. In this link, you can learn more about the benefits of green buildings. The World Green Building Council’s guide focuses on three key features to make your home healthier: Air quality, thermal and acoustic comfort, and light. Did you know that more than half of the air you breathe is inhaled inside your home? The problem is that cooking and heating can cause indoor air pollution, which is harmful to your health. Installing solar panels, improving your home’s ventilation, and reducing pollutants are all good strategies for fighting indoor air pollution. Homes that are excessively noisy and too hot or too cold can have a negative impact on the health of its occupants. Poor thermal control is associated with respiratory illnesses, asthma, and mental health issues. You can avoid it by planting trees around your house, using shades to block unwanted sunlight, and painting your roof white. Finally, install roof windows, choose more efficient LED light bulbs, and use dimming sensors to reduce energy waste. Living in a dark home contributes to headaches, insomnia, and seasonal affective disorder, which is why lighting is very important. Green energy is becoming more popular than ever. Whether it’s solar panels, wind turbines, or other methods, 18% of all electricity in the United States is now created using renewable resources. Although its legality has differed from state to state, the Rainwater Collection Act means Californians can now begin harvesting rainwater. Rainwater harvesting is the process of collecting rainfall into large containers and using it for household tasks and irrigation. Collection systems can vary from household to household; some residences have a simple barrel placed beneath a downspout while others have elaborate collection vats connected by a series of pipes. With areas of northern California receiving an average of 40 inches per year, there is plenty of opportunity for homeowners to take advantage of this resource. What are the Advantages of Rainwater Harvesting? The primary goal of rainwater harvesting, as outlined by communities like Berkeley, is to provide an alternative water supply for landscape irrigation. The average summer temperature can reach highs of 92℉, so lawns and gardens can become parched if left unwatered for too long. This problem is only further exacerbated by California’s recent droughts. Rainwater harvesting is not only a great way for homeowners to save money, but also to preserves local aquifers in case of future emergencies. It also limits the amount of stormwater that would normally runoff through the property. Stormwater picks up dangerous pesticides and pollutants while passing to the ocean, and can contaminate pristine areas and bodies of water. By gathering this stormwater and using it, you will preserve these areas and restrict pesticides to an enclosed and manageable environment. Between architects, engineers, and construction companies (AEC), the process of erecting a building is filled with opportunities for miscommunication, mismeasuring, and misfortune. Luckily for those in the field of construction, technology has now caught up to meet their needs with one incredibly useful tool: BIM. Building Information Modeling (BIM) is an exciting opportunity for AEC businesses across the globe that are planning new construction projects. 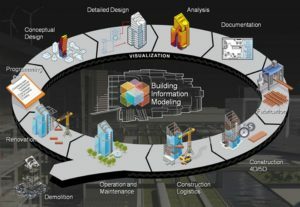 The goal of BIM is to take data from architects and engineers and produce a thorough representation of the structure that will be referenced throughout the development process. While physical blueprints are always vulnerable to human error and miscommunication between architect and building crews, BIM provides a 3D model that provides an in-depth analysis of the structure’s functionality, as well as constant contact between all parties involved in its development. If any user changes the designs to better fit their needs, the changes are also applied to all views for all parties. BIM isn’t just useful as a producer of structure models and project plans, it also delivers key information for ongoing maintenance of the building. Maintenance data displayed by BIM includes heatmaps for tracking energy distribution in buildings as well as areas of high pressure where future repairs may be needed. Computer Aided Design (CAD) does work when drafting basic home structures, but is incredibly limited due to its lack of parameters. BIM possesses a vast catalogue of supplies and building materials, creating a true-to-life depiction of your project and presenting the practical effect of your choices and plans. Unlike CAD, BIM is also used for civil and road engineering as well as urban infrastructure design. With the new developments taking place in South Los Angeles, there has never been a better time for AEC companies to join the construction revolution. Call us today at (877) 810-7473 or visit us online to find out how BIM technologies can work for you. Global tourism is one of the largest economic generators in the world, with the tourism industry generating over $7.5 trillion in 2014 alone. Although more people than ever are packing their bags and heading to the airport, few consider the environmental and cultural impact of their journeys. As more communities are opening up to visits from foreign travellers, a new consciousness is also growing amongst backpackers in the form of “ecotourism”. Ecotourism is, at its core, a respect for local communities and environments while travelling through them. It includes travelling to and learning about ecosystems and communities not normally considered tourism hubs. The idea of ecotourism began in the 1980’s as travellers became more familiar with the diverse cultures and the precarious ecosystems they were visiting. As the years passed, ecotourism has slowly entered the public conscience and is recognized in most countries globally. In fact, 11.4% of all consumer spending was estimated to be on ecotourism and 2017 was declared the International Year of Sustainable Development by the United Nations. Because these destinations are not normally chosen sites for travellers, ecotourism provides a much needed economic boost to local communities. Employment in these areas is able to grow due to new industries that cater to travellers, meaning that your money stays in the community and supports updates in local infrastructure. In a time where the environment is constantly under threat, ecotourism also allows communities to take ownership of their natural environment and maintain its beauty by controlling tourism avenues. Ecotourism is also important to the travellers themselves, as visiting these regions and learning about communities can provide a more holistic view of the world and the importance of preserving the environment. At Creed LA, our goal is to combine environmental restoration with economic expansion, a goal that fits perfectly with the ideals of ecotourism. Call us today at (877) 810-7473 or check us out online to find out more about our mission. Whether it’s peaking over the horizon on a clear autumn morning or shining through a window on a summer afternoon, there is something truly special about sunlight. In addition to providing the energy for the earth and all living things on it, sunlight is something to be enjoyed by all, regardless of whether they are spending time inside or outside. When it comes to architectural design and construction, natural light is often incorporated into a building’s design for aesthetic as well as functional purposes. The question, then, becomes: does one have a right to light? Believe it or not, this is an age-old question when it comes to property. What Is “Right to Light”? “Right to light” refers to a building owner’s right to receive sunlight through windows, skylights, and other openings. Laws and regulations vary worldwide, but they typically apply to longstanding buildings that have maintained a certain level of illumination for many years. These laws often prevent new construction that would interfere with the amount of light entering a building with an established right to light. The right to light is an easement under English law. However, where you are in the world will define how the right to light question is answered. In England, you may even still see “Ancient Lights” signs marking points where the light may not be infringed upon. In Tokyo, sunshine has been deemed by courts to be “essential to a comfortable life.” In Denmark, their light laws have even impacted how windows are designed. Within the United States, the question of right to light is addressed in more ways than we can count. Originally, the English law was adopted. However, in 1959, a Florida court struck down the right to light law. Since then, each jurisdiction has adopted their own way of dealing with this issue. Some deal with it in terms of an easement. Others deal with it in terms of a legal nuisance. Since the photovoltaics of solar are so dependent upon proper lighting, some states use solar easements and solar rights to help define the issue. In most instances, a proper balance can be found through a coordinated effort among the land developer, community, and individual parties involved. Even the trees need sunlight and must be factored into this equation. For land developers and other construction industry professionals, being a good steward of the construction process means considering and preventing erosion issues. Planning and implementing erosion mitigation efforts can yield big results. Sometimes, erosion control during a construction project is statutorily required. In other instances, construction professionals focus on erosion control regardless of outside regulations. In either case, following certain well-defined steps can help to mitigate erosion at a construction site. If you are undertaking a construction project, ensuring that erosion is controlled on the site will be key to your success. Doing so requires careful planning to take several things into account, including the type of construction, the location (e.g. urban vs. rural), and the slope and grade of the land. The development’s proximity to waterways and riverbanks, and the amount of existing vegetation on the land also need to be considered. At a construction site, erosion control should already have been factored into the management of the planned project. As in nature, erosion during construction is largely driven by two natural elements: wind and water. Specific characteristics of the project, namely where it is located, will also impact the amount of erosion that occurs. It’s important to remember that erosion control measures have both on-site and off-site impacts to consider. Erosion control does not have to be an expensive endeavor in order for it to be effective. Effective erosion management can best be achieved by understanding the basic principles of erosion control. The principles start with increasing resistive forces and reducing erosive forces exerted by wind and water. Construction professionals should also utilize sediment control for cost-effective sediment remediation and limit soil exposure to water and wind. It’s also important to reduce runoff velocity via grading and slope management. Topography should be modified with short, shallow slopes (where applicable), and erosion-preventative vegetation should be added to longer, steeper slopes. Finally, developers should regularly inspect, evaluate, and repair the site as needed. Just like any other part of the project management plan, erosion control on a construction site should be planned thoroughly. Careful attention to some basic construction activities can help manage erosion for the benefit of the project and the surrounding community. Many things have changed since Thomas Edison popularized the light bulb in the late 1800s. Whether for survival or comfort, our society relies heavily on electricity, and energy storage has become one of the most important technologies we have today. As we move toward a sustainable world, energy storage significantly contributes to set the foundation for cleaner and more renewable energy sources. A few years ago, California set a goal to have 33 percent renewable energy by 2020. One of the strategies used to achieve that goal is through an increase in the use of energy storage technologies for solar power. The objective is to make the current grid system less harmful for the environment and more cost-effective. Because the grid system is oversized to serve demand peaks, part of the capacity is wasted during other moments of the day, but energy storage technologies can help fix this problem. Environmental awareness is not the only reason that energy storage is a hot topic now, though. Investing in this type of technology may open the possibility for restructuring power markets to make more efficient use of electricity while lowering costs related to peak energy demand. The decreasing cost of battery storage is considered one of the factors responsible for the growth of electric vehicles—and it should have a positive impact on other industries, too. Fortunately, it won’t take too long to see the benefits of all these energy storage trends. Did you know that people spend approximately 90% of their time indoors? With so much time spent inside, it’s essential to make sure buildings will have a positive impact on everyone’s health. Illness isn’t the only thing that can make you feel sick. Your house, school, and workplace play a significant role in your health, too. When you spend too much time inside a building, you can get headaches and develop respiratory issues due to poor ventilation or improper temperature control: This is called sick building syndrome and it affects millions of people worldwide. Biological contaminants (E.g. : Poor cleaning may result in bacteria, mold, and pollen accumulation in ducts and humidifiers. Choose supplies, furnishings, and building materials with low chemical emissions. Keep temperature consistent through the day and follow recommended standards. Vacuum and clean surfaces regularly to prevent dust and pests. Test water quality and install a water purification system, if necessary. Protect people against outdoor noises and ensure good room acoustics. We hope this information will help you see buildings in a new light. If you need inspiration, here are five great examples of buildings designed to make people healthier. At CREED LA, part of our mission is to ensure that the construction industry in Los Angeles supports projects that positively impact the community and considers local and environmental impacts. That’s why we support green building initiatives in Los Angeles and beyond. To find out more about how CREED LA is committed to a better LA, visit us online or call (877) 810-7473 today. The risks of prolonged sun exposure are higher for outdoor workers due to the nature of their jobs, so it’s essential to take some safety measures—especially during summer. According to the Occupational Safety and Health Administration of the United States, more than 40% of heat-related worker deaths occur in the construction industry. How do we evaluate the risks of sunny weather to protect these workers? Less than 91°F: Low risk level; requires basic heat safety and planning. 91°F to 103°F: Moderate risk level; requires the implementation of precautions. 103°F to 115°F: High risk level; requires additional safety measures to protect workers. Greater than 115°F: Very high to extreme risk level; requires strong protective measures. Talk to workers about the importance of wearing sunscreen and drinking water. Encourage them to drink water over soda because drinks containing caffeine may lead to dehydration. Plan safety training to educate everyone on the risks of prolonged sun exposure. Emphasize the importance of drinking water often. The Occupational Safety and Health Administration suggests an average of 4 cups/hour. Make sure the workers are taking regular breaks in a cool or shaded area. Supervisors should monitor workers and watch for signs of heat-related illness. If possible, reschedule activities to a time when it’s not too hot outside. Alert workers of high risk conditions and enforce work/rest schedules. Use cooling equipment and techniques to help reduce the heat. Supervision is extremely important, so you need someone prepared to identify heat-related illness and implement preventive measures. These weather conditions are very dangerous for your workers’ health. Reschedule non-essential tasks for days with a lower heat index. If possible, move essential activities to night shifts. Regular physiological monitoring is a must to ensure that everyone is healthy. Stop work if you can’t implement adequate safety measures. It’s time for cities to take their climate roles seriously. In fact, many cities around the world are implementing 100% renewable energy, and there’s no better time for the rest to get on board. More than 40 cities worldwide have taken up the challenge to get all of their energy from renewable, sustainable sources, and many more have committed to future plans. Let’s take a look at some renewable energy technologies that are leading the way. Sunlight touches every city, and that’s what makes it a formidable renewable energy option. There are so many ways to deploy solar technologies; it’s no longer only available for roofs. In fact, transparent solar panels can capture sunlight from windows as well, which can allow buildings to generate even more solar energy than before. Solar power is on the rise, and cities can begin by setting goals and leading by example to boost the solar market. Installing solar on public buildings is a good place to start! Wind power is cost-effective; land-based wind power is one of the lowest-priced energy sources available. Clean, renewable, and domestic, wind is a ideal energy alternative for cities. Traditionally, cities collect wind energy from turbines, and many sites can coexist with farm or ranch land. More recently, scientists have optimized wind turbines for cities so that builders can incorporate them into buildings to help supply urban energy. Hydropower is electricity that moving water generates. In fact, among the successfully sustainable cities, hydropower is the most common source of energy. Hydropower is consistent, reliable, cost-effective, and flexible. However, hydropower also comes with a set of environmental concerns; while it is preferable to fossil fuels, planning is essential to ensure that hydropower is truly sustainable. The more each city does individually, the better the combined environmental result will be. Who’s ready to get started? At CREED LA our mission is to ensure that the construction industry in Los Angeles has a highly trained and professionalized workforce that supports projects that have positive impacts for the community. Environmental sustainability is an essential part of that goal, and renewable energy is one of the best places to start. To learn more about our mission, contact us online or by calling 877-810-7473.